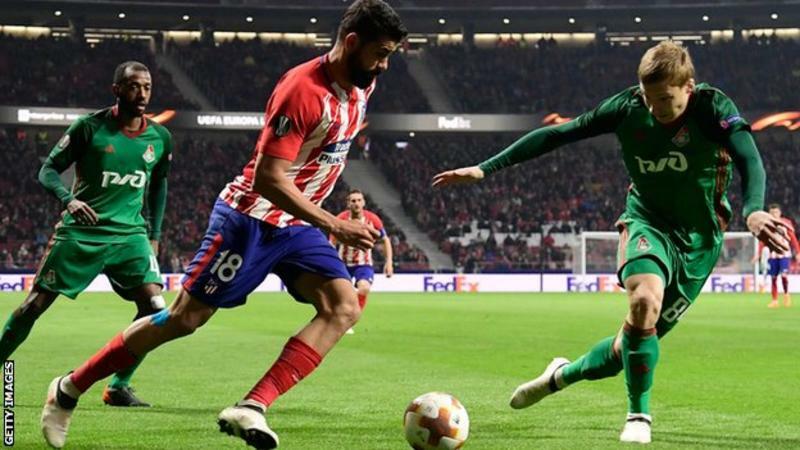 Diego Costa scored as Atletico Madrid took a huge step towards a place in the quarter-finals of the Europa League with victory over Lokomotiv Moscow. Costa netted his sixth goal in 12 appearances since moving back to the Spanish side from Chelsea in January. Saul Niguez and Koke were also on target for the 2010 and 2012 winners. Lokomotiv are seven points clear at the top of the Russian Premier League, but now face a substantial deficit going into next week's return leg. "In the whole game we were superior," Atletico coach Diego Simeone said. The home side opened the scoring midway through the first half courtesy of Niguez's superb strike from 30 yards that sailed into the top corner. Costa added Atletico's second at the start of the second half by steering home the rebound after Antoine Griezmann's shot had been saved. Griezmann and Costa were both withdrawn as the half progressed, but there was still time for Koke to burst into the area and find the corner. "In no way did I feel embarrassment for the team," said Lokomotiv coach Yuri Semin. "We do not consider the tie lost."